Is there anything more human than the sense that maybe you just don’t belong? It’s that nagging desire for connection that won’t go away, no matter how frustrated or disconnected you may feel. 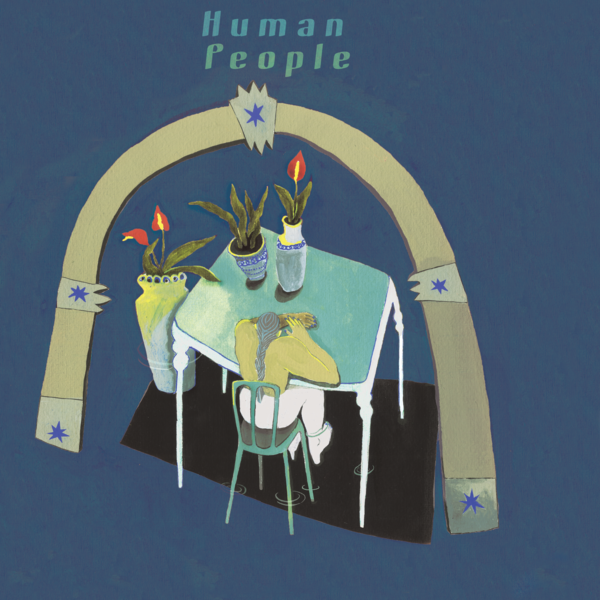 For the aptly named New York four-piece, Human People, that tension between closeness and isolation fuels their raucous debut full-length, Butterflies Drink Turtle Tears. Hayley Livingston (guitar/vocals), Marisa Gershenhorn (guitar/vocals), Vicki Guillem (drums), and Abby Austin (bass) met in 2014 amongst NYU and the city's indie rock scene. They bonded over a shared love of classic punk, and soon after joined forces to create Human People. In 2016, they released two EPs—Sleep Year and Veronica—that blended the primal energy of early New York punk, the off-kilter tunefulness of ‘90s alternative, and the unbridled eccentricity shared by their community of fellow Northeastern musicians (bands like Washer, Stove, and Remember Sports). The band carved out a unique space with their wide range of influences (everything from post-punk to riot grrrl to power-pop), sharp lyrics, and energetic live shows, all the while navigating the existential messiness of college, interpersonal relationships, and one’s own inner dialogue. On Butterflies Drink Turtle Tears, Human People offer their brightest hooks and tightest arrangements to date. But for an album so sonically confident, its lyrical sensibility has a distinct interiority. Gershenhorn and Livingston wrote their contributions separately and unexpectedly found their respective songs revolved around common threads of detachment and isolation. These are punk anthems that channel the unsettling sensation of being surrounded by people yet feeling totally alone. It’s a difficult to verbalize but universal frustration; the inescapable craving to connect with others while often finding nothing and no one to relate to. “California” displays the band’s sardonic side while revealing the kind of anxiety that often lurks beneath a care-free surface, and tracks like “Black Flowers” and “Jenny” explore how the gulf between yourself and everyone else can be difficult to bridge, especially when that withdrawal is self-imposed. Throughout the album Human People are vulnerable yet biting, wearing flaws and dissatisfaction on their sleeves, self-reflective but never apologizing for feeling. With Butterflies Drink Turtle Tears Human People have made an album that’s somehow just as perfect for a crowded basement show as it is for night alone in your room staring at the ceiling. It’s an album without pretension, full of the kind of openness and effortless chemistry that can only come from four best friends making music together; it’s palpable and infectious, and it makes you want to sing along with them—we’re only human after all.